Oakpointe Communities and Presidio Residential Capital have received unanimous approval from the City of Covington to develop LakePointe Urban Village, a 214-acre master-planned mixed-use community at Hwy 18 and Southeast 256th St in the growing community of Covington, WA, approximately 30 miles from Seattle. The project is slated to include an 850k sf regional entertainment and lifestyle center, a 130-key hotel and up to 1,500 single-family and multifamily residences. 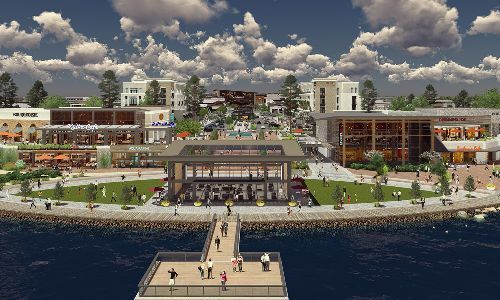 The centerpiece of the community, designed by KTGY Architecture + Planning, will be a peninsula extending into a 20-acre lake with retail shops, restaurants, single-family and multifamily homes, a pavilion park, open space and trails. It offers a symbiotic relationship between public and private as well as indoor and outdoor spaces and a gathering place for the community. With a main street that allows for vehicular and pedestrian traffic, LakePointe will feature contemporary buildings with some eclectic and traditional design elements to give the community a sense of timelessness. Groundbreaking is expected to begin in early 2018. The value of this project will exceed $670 mil. According to Brian Ross, CEO of Oakpointe Communities, the firm is already in lease discussions with a variety of prospective tenants including major retailers, a multiplex theater, restaurants, outdoor cafés and coffee shops, wine bars and breweries, soft good retailers, specialty and boutique retailers as well as a gourmet grocer and other neighborhood serving and lifestyle retail.